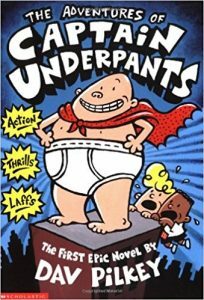 Captain Underpants: The First Epic Movie is a 2017 animated superhero comedy film based on the children's novel series of the same name by Dav Pilkey. It stars the voices of Kevin Hart, Ed Helms, Nick Kroll, Thomas Middleditch, Jordan Peele, and Kristen Schaal. If you like silly, unusual superheroes, these books are just for you. Fourth-grader Frankie Piccolini has a vivid imagination when it comes to cleaning his disastrously messy room, but eventually, even he decides that it is just too dirty. When imaginations go wild in the schoolyard, anything can happen. Normal kids become world-saving heroes, girls become power-hungry pirates, and zombies take over the school after being infected by the dreaded epidemic - cooties! It's up to Scrap, his partner Yoshi (don't you dare call her a sidekick! ), and Clinton, the baddest cowboy in the, um, badlands, to stop recess from collapsing into total apocalyptic chaos. Thirteen-year-old Sully Stringfellow, his arch-nemesis Izzy Cisco, friend Moleman, and a league of long-forgotten plumber heroes team up to save Nitro City from mutant creatures in the sewers. View more suggestions for Captain Underpants.